Buying or upgrading to Windows 10 Pro allows you more options to manage Windows 10 updates on your terms. How can I stop Windows 10 updates? Whether it’s preventing Windows 10 from kicking off a critical update during a presentation, or deferring Microsoft’s Windows 10 feature update because of worries about data loss, it’s a question we’ve all asked. You shouldn’t block all Windows 10 updates. But you can manage them. Windows 10 feature updates and security updates provide a valuable service: they not only patch Windows, its apps and components, but provide new features and capabilities twice a year. Windows Update can also automatically provide updated drivers for hardware connected to your PC, such as a USB-attached printer. As we write this, however, Microsoft is wrestling with the fallout from the Windows 10 October 2018 Update, which apparently deleted user data in an undisclosed number of cases and was put on hold, then resumed. Would you want to buy a car if it had even a 0.001 percent chance of exploding? Probably not—which is why it’s good to know how to manage Windows 10 updates, now and in the future. 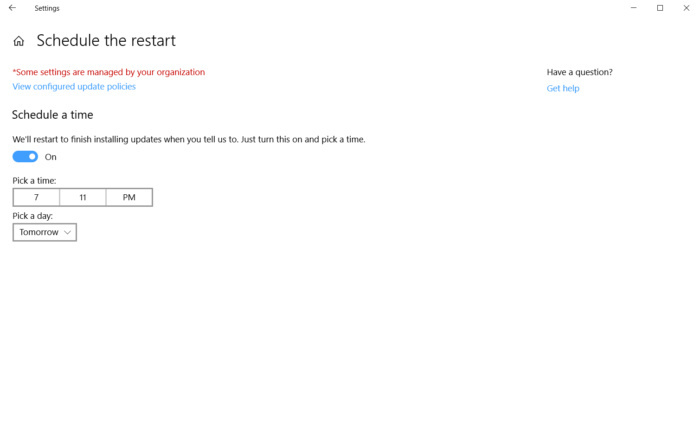 This is the main Windows Update screen, which will inform you if any updates are pending. 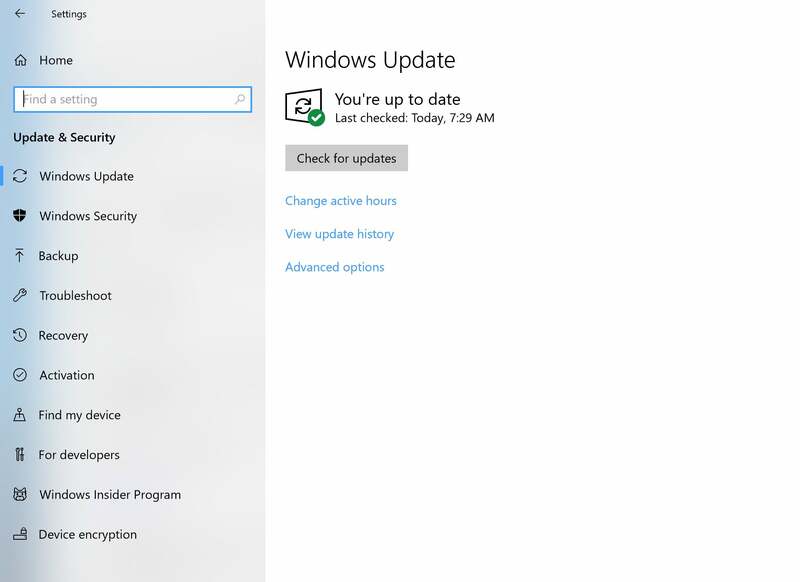 Clicking the Update now button will query Microsoft to see if any updates are available. When you’re building a PC you have two choices of Microsoft's Windows 10 operating system: Windows 10 Home and Windows 10 Pro. Windows 10 Home can be the cheaper alternative, at $139. But at $200, Windows 10 Pro offers some advantages, too. 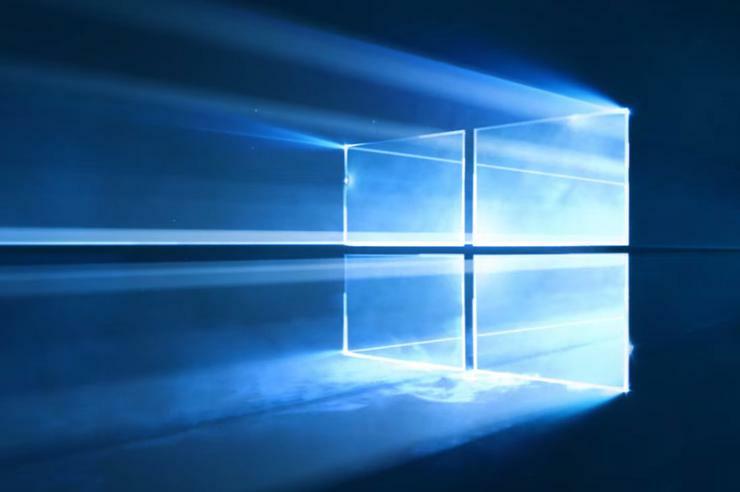 We previously identified five features that would make you want to switch from Windows 10 Home to Windows 10 Pro, but in this case we’d add a sixth: the ability to more finely manage Windows updates. Windows 10 Pro allows you to defer updates for days and days. If you’re a Windows 10 Home user, you may as well accept your fate: Windows 10 updates—both periodic security updates, as well as the semi-annual feature updates—will arrive on your PC almost as soon as they’re released. Don’t worry, though, as Windows Home and Pro users alike have some defenses against an unexpected Windows 10 update: Active Hours, Restart reminders, and Metered updates. 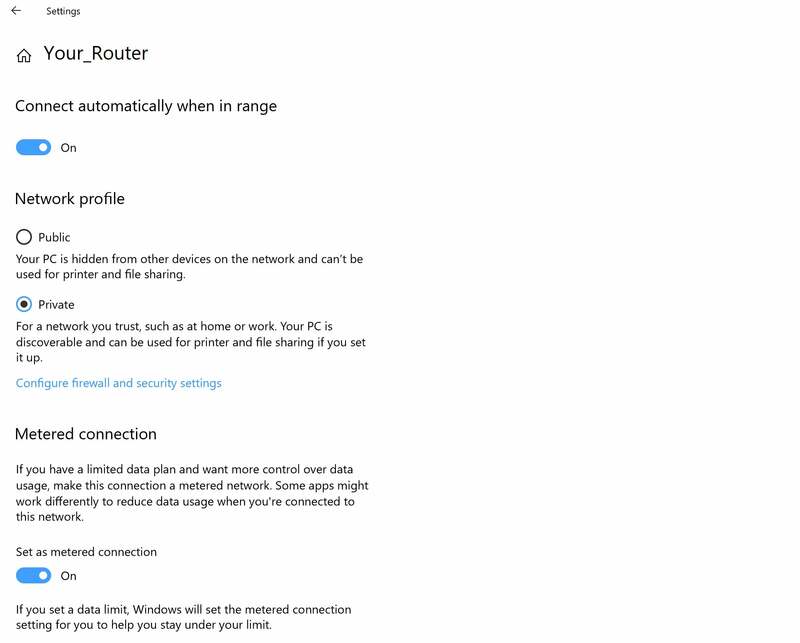 Windows 10 Home users will see this advanced options page. Always make sure to have the “We’ll show a reminder” toggled on, and it’s not a bad idea to have Windows manage updates for other Microsoft products, too. To access them, first navigate to the Windows 10 Settings menu, then to Home > Update & Security > Windows Update > Advanced options. Active Hours can be a Windows 10 Home user’s most potent weapon against unexpected Windows 10 updates. 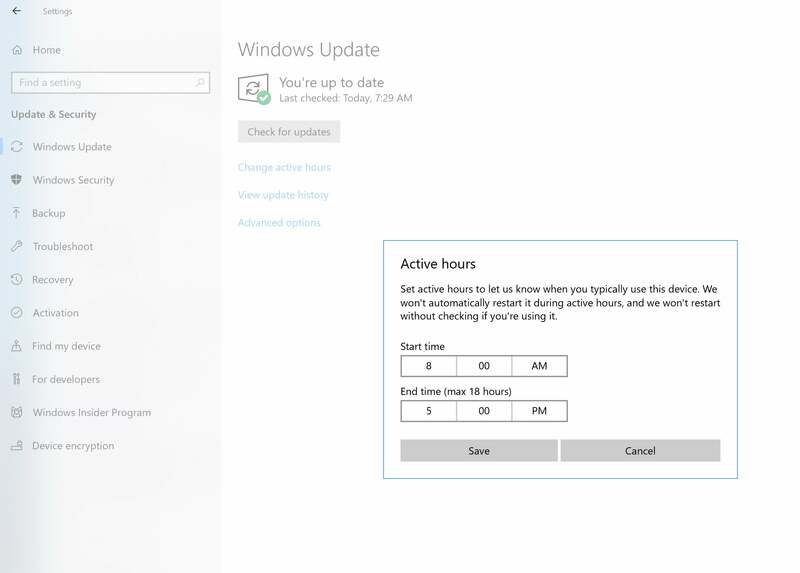 (This setting is found in Home > Update & Security > Windows Update > Change active hours.) It’s here that you can tell Windows when you’re actively using your PC, and when it shouldn’t update Windows. The default is business hours: 8 a.m. to 5 p.m., though you can set a window for up to 18 hours later than the start time. Active Hours shouldn’t allow the update to occur during that period. Be careful, though, as the update could still kick off at, say, 4 a.m., when Active Hours is disabled and you’re not at your PC. 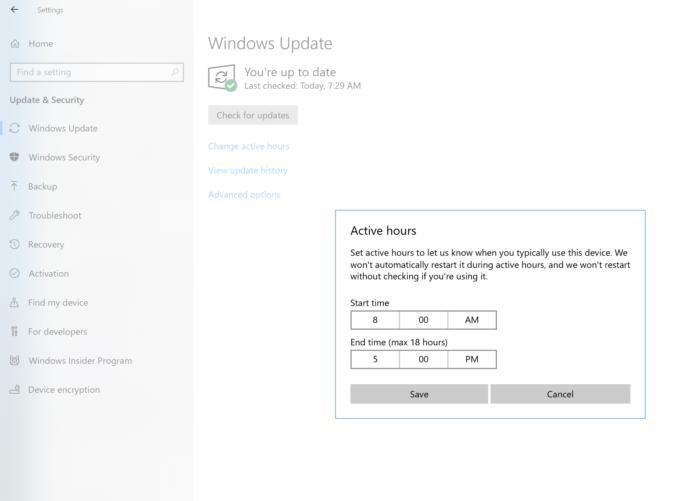 Active Hours are the other active means of defense against an unexpected Windows update. Make sure you have these turned on and configured to when you’re using the PC. It’s not perfect: If you’re at lunch, for example, the notification may pop up and then have disappeared by the time you’ve returned. But there should at least be a reminder in your Notifications that an update is in on its way. 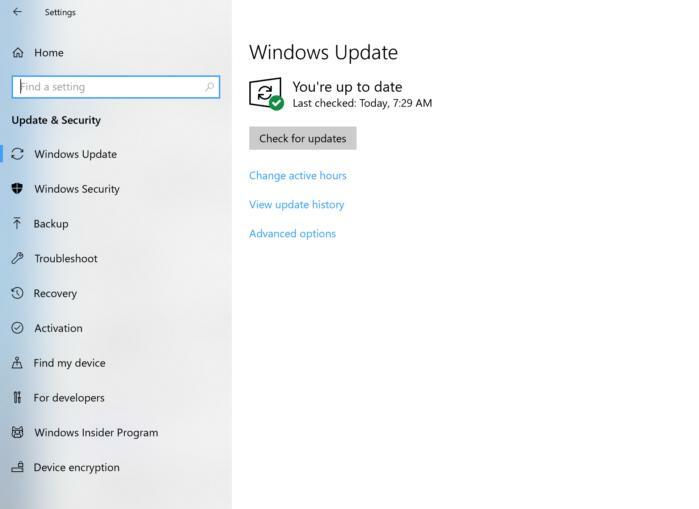 Preventing Windows updates from downloading over metered connections can be a sneaky way of possibly preventing an unwanted Windows update. Windows now recognizes that some users may have metered data connections, with strict limits on how much data they can download per month. Microsoft politely allows you to defer an unexpected update via a metered connection, so you don’t pay an extra fee. You can set a wireless connection to “metered” to help limit unwanted Windows updates. Your router name will appear at the top. Windows is unaware whether a connection is metered, however. (And yes, you can lie.) Designate your broadband connection as a metered connection by going into Settings > Network & Internet, then Change connection properties. It’s here that you’ll see a toggle to Set as metered connection. You can then go back into the Windows Update settings and toggle Automatically download updates, even over metered data connections... to Off. Unfortunately, the default behavior when your PC is connected to ethernet is to think that your PC is on an un-metered connection. And when you’re connected to Wi-Fi, Windows will still probably download “priority” updates, so this can’t really be considered a foolproof solution. And if you have multiple Wi-Fi connections available, you’ll have to set all of them as metered, too, which is a pain. All in all, a more convenient option is Windows 10 Pro. All of the settings and options above are available within Windows 10 Pro, but there are some additional options that actually allow you to choose when updates can be installed. If you own a Windows 10 Home PC, you can upgrade from Windows 10 Home to Windows 10 Pro from within the Windows Store app for $99, or you can use this Microsoft Store link from a Windows 10 Home machine. The additional options circled in red are made available with Windows 10 Pro. In fact, the Windows 10 Settings menu which includes Home > Update & Security > Windows Update > Advanced options will include many more options with Windows 10 Pro, including the ability to pause updates, choose when updates are installed, and the actual deferral of both feature and security updates. 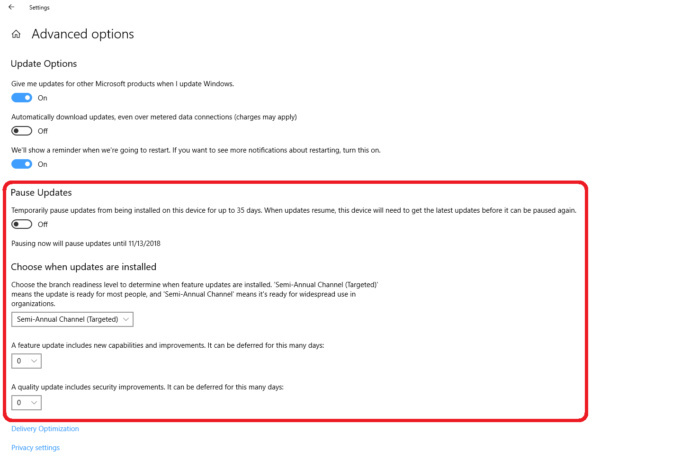 One of the behaviors we've seen on a Pro machine is when an update reminder lands on your machine: Microsoft allows you not only to delay your update, but also to specify exactly when. You can schedule the update for anytime within a week. If you know exactly when you'll be in a position to apply a restart, this option can be terrific. One of the more confusing options is Choose when updates are installed. Here, you have two options: Semi-Annual Channel (Targeted), and just a vanilla Semi-Annual Channel option. These refer to the semi-annual dates when corporations typically receive the feature updates, such as the October 2018 Update for Windows 10. In general, the targeted option means that you’ll receive a feature update on or about the same day as the general public, i.e., the announced “ship date” of a feature update. PCs on the vanilla “Semi-Annual Channel” will receive the update later, after corporate IT departments have provided feedback and Microsoft has issued an update patch to fix any issues. There’s no fixed date for when you’ll finally receive the feature update under the Semi-Annual Channel. However, this is the most conservative setting if you’re still granting Microsoft the freedom to roll out a feature update when it chooses. A drop-down menu allows you to select how long to defer either feature updates or “quality” updates, which can include security updates. You can tack on extra time if you want. Near the bottom you’ll see options to defer feature updates and quality updates. In fact, Microsoft’s less concerned about when you receive a feature update, because you can defer it for a full 365 days. Security or “quality” updates are more essential, and your window is even smaller: 30 days. If you’re concerned about a bad patch, however—and they do occasionally happen—the update deferrals should protect you. The final option is what you might call a vacation hold for patches: Pause updates. There’s no mystery here; if you’re traveling abroad or just don’t want to be bothered with unexpected patches on a business trip or vacation, you can simply block them for up to 35 days. And you can do it again and again. The catch, though, is that you’ll need to download and update Windows before you re-enable the Pause updates feature. If you’d like to be a little cautious before downloading feature updates, use these tips! The caveat in all of these, obviously, is that Windows 10 is an evolving platform, and Microsoft occasionally adds, subtracts, or adjusts the behavior of various features. Others, such as our earlier tip on how to upgrade Windows but prevent it from unexpectedly rebooting, may work now, but be quietly disabled in the future. 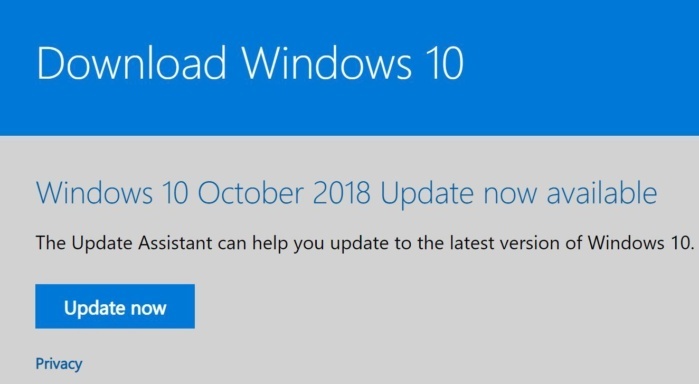 Microsoft was supposed to have included a smart updater AI feature within the Windows 10 October Update to help mitigate unexpected Windows updates, but it appears to have been pulled. The bottom line is this: Windows updates are beneficial to you and your PC. But how Microsoft manages them could use some improvement. You can use these tips to meet in the middle.